"Elfego Baca - One Man, One War"
22" x 16" x 16"
Artist's Concept: This sculpture is a tribute to a "Courageousness" that transcends ethnic or temporal differences and pays honor to the highest and best that lies deep within all human beings. The objective is not to further the divisiveness of bigotry that Elfego Baca fought against, and which continues to this day, but rather to unite us all in the relentless struggle against tyranny. 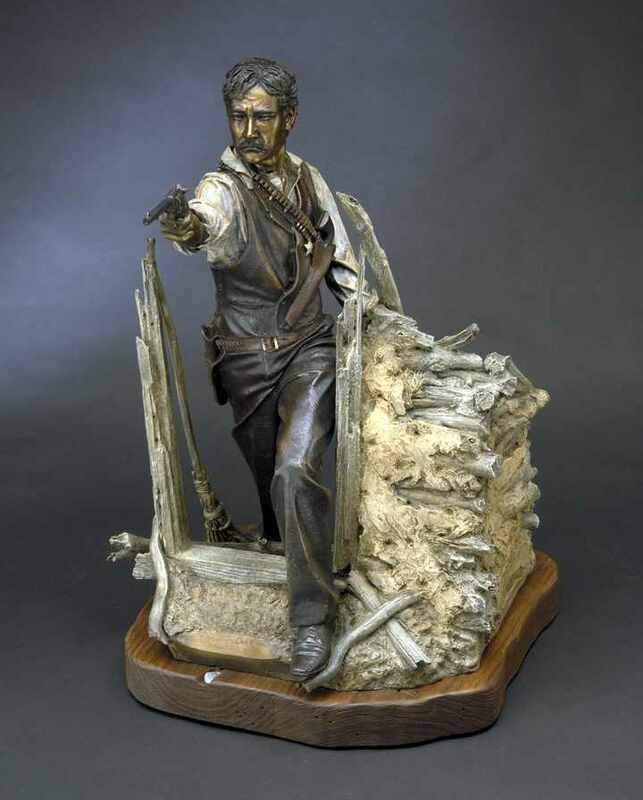 Rendering: The design captures Baca's signature moment - his single-handed gunfight against overwhelming force of 80 Texas cowboys in Reserve, New Mexico. He is stepping up through a doorway in the demolished wall of the "jacal", as if rising from a grave into the light of life, with a determination born of true courage. He has looked death in the eyes and not flinched for his strength comes from a higher Power.